Comforting a friend or relative in distress may be a more hard-wired behavior than previously thought, according to a new study of bonobos, which are great apes known for their empathy and close relation to humans and chimpanzees. This finding provides key evolutionary insight into how critical social skills may develop in humans. The results are published in the online journal PLOS ONE. Researchers from the Yerkes National Primate Research Center, Emory University, observed juvenile bonobos at the Lola ya Bonobo sanctuary in the Democratic Republic of Congo engaging in consolation behavior more than their adult counterparts. Juvenile bonobos (ages 3 to 7) are equivalent to preschool or elementary school-aged children. Zanna Clay, PhD, a postdoctoral fellow in Emory's Department of Psychology, and Frans de Waal, PhD, director of the Living Links Center at Yerkes and C.H. Candler Professor of Psychology at Emory, led the study. "Our findings suggest that for bonobos, sensitivity to the emotions of others emerges early and does not require advanced thought processes that develop only in adults," Clay says. Starting at around age two, human children usually display consolation behavior, a sign of sensitivity to the emotions of others and the ability to take the perspective of another. Consolation has been observed in humans, bonobos, chimpanzees and other animals, including dogs, elephants and some types of birds, but has not been seen in monkeys. At the Lola ya Bonobo sanctuary, most bonobos come as juvenile or infant orphans because their parents are killed for meat or captured as pets. A minority of bonobos in the sanctuary is second generation and raised by their biological mothers. The researchers found bonobos raised by their own mothers were more likely to comfort others compared to orphaned bonobos. This may indicate early life stress interferes with development of consolation behavior, while a stable parental relationship encourages it, Clay says. 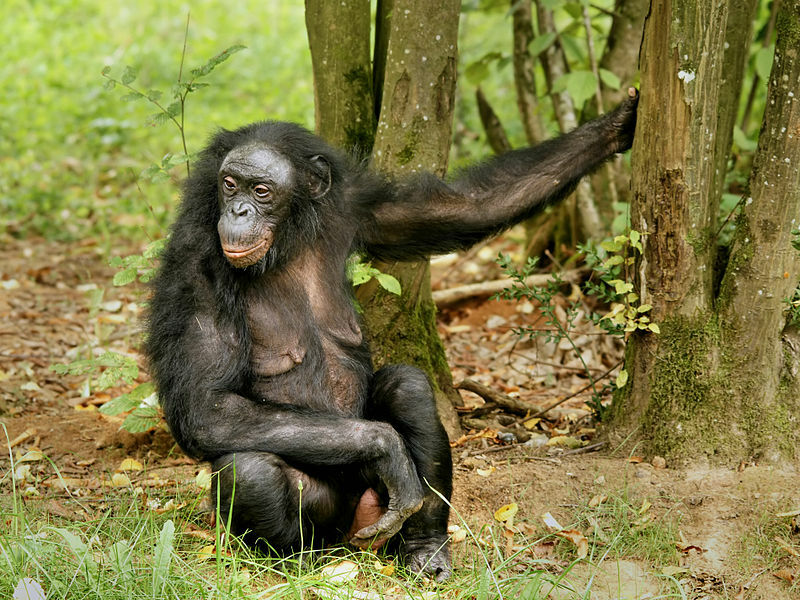 Clay observed more than 350 conflicts between bonobos at the sanctuary during several months. Some conflicts involved violence, such as hitting, pushing or grabbing, while others only involved threats or chasing. Consolation occurred when a third bonobo – usually one that was close to the scene of conflict – comforted one of the parties in the conflict. Consolation behavior includes hugs, grooming and sometimes sexual behavior. Consolation appears to lower stress in the recipient, based on a reduction in the recipient's rates of self-scratching and self-grooming, the authors write. "We found strong effects of friendship and kinship, with bonobos being more likely to comfort those they are emotionally close to," Clay says. "This is consistent with the idea that empathy and emotional sensitivity contribute to consolation behavior." In future research, Clay plans to take a closer look at the emergence of consolation behavior in bonobos at early ages. A process that may facilitate development of consolation behavior is when older bonobos use younger ones as teddy bears; their passive participation may get the younger bonobos used to the idea, she says.